As mentioned in this recipe, this bread is indeed a good bread for toast, sandwiches, and French toast. It is even delicious on its own and un-toasted. As said, this bread is indeed golden in colour and its smell alone can makes us salivate when it was baking in the oven. It is brioche-tasting and yet soft, spongy and less guilty to indulge. This bread recipe is from the book, Bread by Nick Malgieri. I must thank my two baking buddies, Joyce from Kitchen Flavours and Lena, from Frozen wings for suggesting this recipe to me because my family and I really enjoy eating it. Lucky that I can predict that this is going to be a good recipe and baked two loaves according to the exact quantity mentioned in the recipe. We ate one loaf when it was freshly baked and froze the other one for later use. The frozen ones were eventually thawed and consumed as toast. They were very light and crispy when toasted. Yum! This recipe yields a sticky dough and so it is best to mix and knead using an electric mixer or a bread-maker. Try to resist using too much flour while shaping the dough into loaf as the increase of flour content might toughen the texture of the finishing breads. 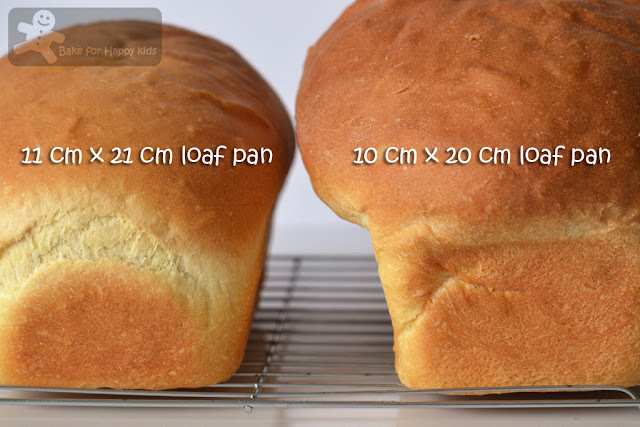 Use a 21 cm x 11 cm baking tin to bake your loaf. I baked one of mine in a slightly smaller tin and it looks like a balloon baking in such a small tin. The breads rose very nicely after their final proving and baking. Mum, are we baking a balloon? - To avoid this comment, use the right baking tin. LOL! Update on 21 Sep 2016: Hi! Hi! Here I have incorporated the tips that I have mentioned earlier at Jan 2013 (see the above text). To do so, I had re-calculated the amount of ingredients required to bake two standard 8-inch 20 x 10 cm loaves and re-wrote this recipe. And yielded two perfect loaves!!! YAY!!!! HAPPY!!! The perfect golden sandwich bread that I have baked again. 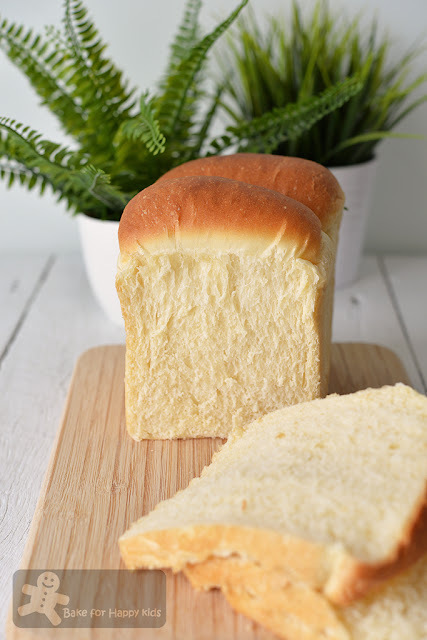 If you interested to bake these highly recommended very cottony soft golden and tall sandwich bread, you want to watch my one-minute video to see how I baked these breads. And here's the re-calculated recipe that can bake two perfect standard 8-inch 20 x 10 cm loaves. 135g eggs from 2 1/2 large eggs, at room temperature, roughly beaten - It is important to use the exact weight and I have used 3 yolks and 2 1/2 egg whites. Place all ingredients into the pan fitted in a breadmaker according to the order of the above list. 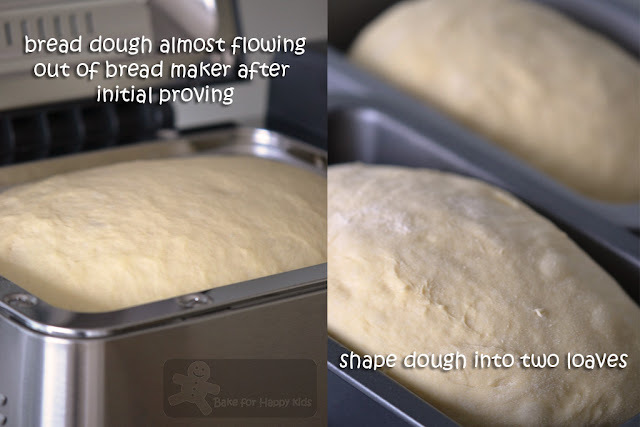 Use the dough setting to knead the dough until it is smooth and elastic and allow the dough to prove for 1 hr. 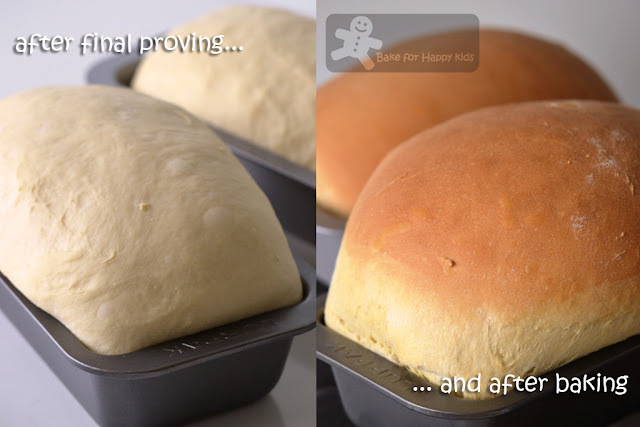 If breadmaker is not available, kneading by hand or an electric mixer with a hook attachment is possible but please be aware that the dough is sticky but not too difficult to handle because it is very elastic. Combine flour, sugar, salt, milk powder and yeast in a large mixing bowl or the mixing bowl of your electric mixer. Make a well in the flour mixture, add water and eggs to form a dough. Using your hands or the electric mixer with low speed, start kneading the dough. While kneading, add butter and keep kneading until it forms an elastic and smooth dough (at least 20 mins) Although the dough is sticky, do not add any extra flour into the dough. Just keep kneading and you will see that the dough become very elastic and easier to handle. Allow the dough to prove for 1 hr or until doubled in size. Grease the loaf pans with cooking oil spray. IMPORTANT tip for shaping: Do not any extra flour to shape and handle the bread dough as the increase of flour content will toughen the texture of the finishing breads. To shape into 2 loaves, divide dough into 6 equal portions and shape each into balls. Allow them to rest at room temperature for about 10 mins. Using a rolling pin, roll each portion into long and flat oval shape (about 20 cm) and roll it again into a Swiss roll shape. Repeat this step with the remaining portions of dough. Place 3 shaped dough with their seams side down into the each prepared pan. Press the top of the dough lightly to form an even surface. Cover loosely with plastic wrap and allow it to prove for another 1 hr or until both dough are risen to the rim of the pans. Preheat oven at 200°C /400°F. Place the loaves into the oven and lower the temperature to 190°C / 375°F bake for 25 mins or until well risen and deep golden, If the top of the bread is turning brown too quickly, cover the breads very loosely with foil at the last 10 mins of bake and continue to bake for at least 25 mins in total. When the bread is cooked thoroughly, unmould them immediately. Transfer onto a wire rack to cool completely. Slice and serve. Keep any uneaten bread in an air tight container at room temperature for up to 3 days, or wrap with freezer bags in portions and freeze for up to 2 months. 1. Combine the flour and sugar in a large bowl and set aside. 2. Pour the water into the bowl of an electric mixer and whisk in the yeast. Wait 5 mins, then whisk again. Whisk in the cooled milk and eggs. 3. Use a large rubber spatula to stir the flour mixture into the liquid a little at a time, stirring to combine between additions. 4. Place the bowl on the mixer with the dough hook and scatter pieces of butter on the surface of the dough; mix on the lowest speed for 1 min. Stop the mixer and let the dough rest for 15 min. 5. Increase the speed to medium, sprinkle in the salt, and beat the dough until it is smooth and elastic, for 2- 3 mins longer. Scrape the dough into an oiled bowl and turn it over so that the top is oiled. Cover with plastic wrap and let ferment until almost doubled in bulk, about 45 mins. Note: For step 1-5, I've used a bread-maker instead of the electric mixer. I've placed all my ingredients into my bread-maker and use "dough" setting to knead and prove the dough for 1 hr. 6. Invert the dough to a lightly floured work surface. Flatten the dough to a disk. Fold the two sides in to overlap at the middle, then roll the top toward you all the way to the end, jelly-roll style. Invert, flatten, and repeat. Return the dough to the bowl (oil the bowl again if necessary), cover, and let ferment until fully doubled, 30-45 mins. Note: I've skipped step 6. 7. Invert the dough to a floured work surface and shape it into a rough square. Use a bench scraper to cut the dough into 2 equal rectangles, each about 715g. Pull the narrow ends of 1 rectangle of dough outward to widen. From one of the wide ends fold the sides in about 1 inch or so, then roll down from the top as for turning the dough. Drop the roll into one of the pans, seam side down. Repeat with the second loaf and pan. 8. Cover with oiled or sprayed plastic wrap and let the loaves proof until they have risen about 1/2 inch above the rim of the pan. Once they're close to the top of the pan, set a rack a notch below the middle level and preheat the oven to 400°F (or 180°C fan forced). Note: My second proving took about 1 hr. 9. Place the loaves in the oven and immediately lower the temperature to 375°F. Bake until well risen and deep golden, with an internal temperature of at least 200°F, 30 to 40 mins. Note: My loaves were baked at 180°C fan forced for 30 min. 10. Unmold the loaves and cool on a rack on their sides. Wrap and keep at room temperature, or double wrap and freeze. 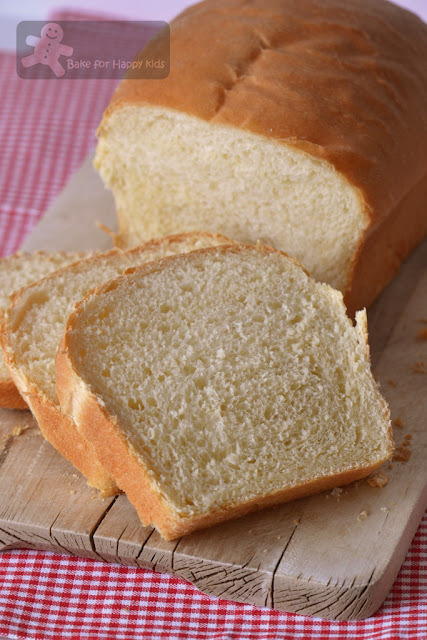 Who doesn't love a delicious, homemade loaf of bread? This bread looks perfect!!!!! What a lovely golden colour bread, I can smell it from miles away! Yes, this is one delicious bread! I can say, one of the best white homemade bread I've made! This bread alone is worth the book! LOL! Love the texture and taste of it! Gosh! Very beautiful and soft looking loaves Zoe! Ok, will try this! Thanks! What a perfect looking loaf! Your balloon shaped bread loaves look so cute. Love the softness of the loaf. My family love this kind of soft and golden bread too. This really look like a great great bread. Wow Zoe. This bread looks delicious! Great job. Seeing that you're successful with this, I'm going to try making it (maybe with some red bean paste added to it too). Your sandwice bread rose so well and looked so pro. Nice. Nice loaves of bread...they sure look very light and fluffy. Have a great week Zoe! Love the loaf, looks so gorgeous! My kids like this type of loaf with nutella or peanut butter. So superbly baked bread.. im book marking it..
Beautiful brad, I love homemade bread a lot . Mmm.... yummy soft bread for breakfast! Nice one, Zoe! Can you recommend any good bread maker? The bread maker that I'm using is a Breville which I can customise the programs according to the schedule that I want. I'm guessing it is an old model and might not be available in the market now. The latest one is Custom Loaf Pro. If you do not need to customise any bread baking program, any basic bread maker should do the job well. This is superb! You are really a pro! It is soon noon here in Switzerland and this bread would be a perfect lunch for me. Looks so yum. Zoe, I must say I loved your balloon shaped loaf. It will be a trendsetter in itself:D:D Perfectly made and so soft. Will certainly refer to this post when my bread baking bug bites me!! OMG, I love those bread that were still sitting in the baking pans, so cute! Actually, I have a few unposted bread recipes but now all I'm thinking is just CNY's themed cooking, hahaha! This is going to be the 8th year that I won't be going home for CNY, sigh, only becoz the airticket cost is normally double up during this time of the year, how to go back? Now that Ethan is going to start school on the 4th Feb, I don't know when can I go back. Hi Zoe, Thanks for stopping my blog! your comment was sweet. Your photos are fab the bread looks and from your description tastes lovley. Oh, your bread looks bakery perfect, Zoe!!! And I don't think I've ever made a Nick Malgieri recipe that I haven't loved! Time to break out the yeast. Thanks for visiting my blog! I love your blog and can't wait to see your future creative creations! The bread looks perfect. I would love to join your baking group sometime! The bread indeed looked so soft and pliable, love the comment from your kid, so cute! I love all sorts of bread esp those that are brioche-like. I try not to make too many brioche cos of the amt of butter, but this looks quite healthy. i think i didnt tell you that i went and lined the pan baking this bread..i didnt know what 's on my mind becos usually i dont do that..the bread stucked onto the paper! aargh!!! Perfect sandwich bread, Zoe. I love my sandwich with turkey ham and lots of cheese! Congrats Zoe and have a nice week! Perfect loaf of bread Zoe! I would love a piece or two! I have been using bread machines for over 2 years. your bread loaves look so yum...i like it so much. Definitely a recipe I'll keeping and using many times. That's beautiful! It reminds me of an old favorite recipe I had called Blue Ribbon White bread. 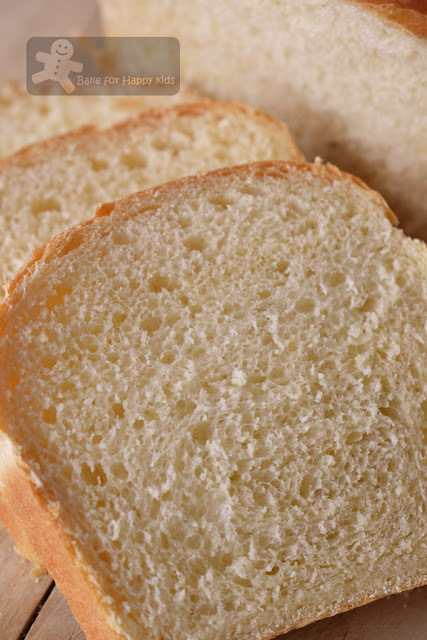 I think a good old white bread sounds lovely right about now... Thanks for sharing and for stopping by, I am having fun browsing through your posts! That is indeed a lovely loaf of soft fluffy bread. I happen to have Nick's book from the library. Will check out this recipe. But first I just *have* to make his cinnamon swirl bread (same book). It sounds amazing. Just wondering if we can excludes the eggs to bake this bread loaf? To be the best result, you should stick on to the original recipe. Cheers!